This summer, you have a special opportunity to speak justice and serve God through advocacy. Every August, your members of Congress head back home to your community to meet with constituents (that’s you!) and listen to what you care about. We need you to add your voice and join us in being an advocate for children everywhere to experience life in all its fullness! Meeting with your member of Congress is the most effective – and rewarding – form of advocacy. How and why did you first get involved with World Vision? I first got involved with World Vision in college. I heard a speaker at my university and signed up to have a sponsor child. My husband and I are still supporting this child now, more than eight years later. What made you get more involved with World Vision Advocacy specifically? I have a history with advocacy work through another organization. I’m also a nurse, so when my church heard about an advocate trip to Kenya with World Vision, they wanted to send me. That trip was life-changing and definitely made me want to continue to be involved with World Vision’s advocacy program. When was your first in-district meeting and how did it go? My first in-district meeting was with my Representative. I got really fired up one day about advocacy and sent a request online to meet with my congressman. After a couple of days and a few emails exchanged with his scheduler, I had a meeting on the books with the Representative himself. The meeting went great! I remember being very nervous. But once the meeting started, it was clear the congressman was not expecting me to be an expert on anything and was genuinely interested in where my passion was as his constituent. We established a relationship regarding our interest in issues of trafficking, justice, and compassion that still continues to this day. I meet with him at least once a year to connect. What’s been your most memorable advocacy experience? Being involved in an advocate summit in Washington D.C. It was amazing to be able to go to the offices of multiple members of Congress, to see our government in action, and to know that I played a role in it. Another memorable moment was when I had a meeting with my congressman shortly after returning from Kenya. This was memorable because our group printed him some pictures of our time there. While discussing these pictures, it was clear he was moved by his own trip with World Vision to Kenya. So that set up a very unique way to continue to grow my relationship with him. What advice do you have for anyone looking to get more involved with advocacy? Do it! Don’t feel overwhelmed or like you need to be an expert. Use your resources. Being willing to share your story and the stories of many people around the world is such a privilege and something you want to be a part of. Also, don’t feel like you need to do it alone: Find a partner, squad, etc. to join you with advocating! So what are you waiting for? Join Rachel and sign up to meet with your member of Congress this summer! Whether you and your member are already very familiar with these issues or are being introduced to them for the first time, you can start a conversation that will make a difference. We’ll provide you with personal support every step of the way, from scheduling your meeting to providing you with talking points and resources you can leave behind. We trust that God and your passion for helping kids living in extreme poverty will do the rest! If yes, how have you contacted them? Yes, I’d like to meet with my members of Congress. 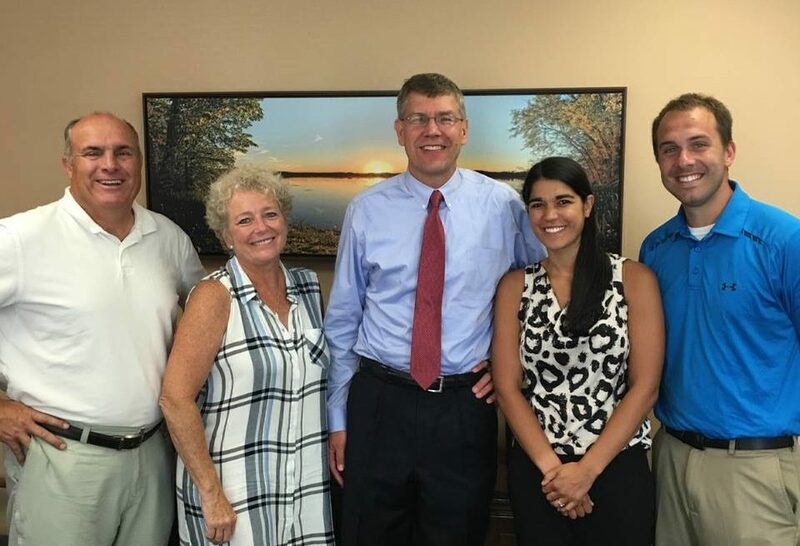 Photo: Rachel and Nathaniel Jeffries (right) and John and Laura Crosby (left) meeting with Congressman Erik Paulsen of Minnesota (center). ← What is happening at the border? What can you do?